The Walton County Sheriff’s Office has been serving its citizens and visitors since 1827 when its first Sheriff, Michael Vaughn, was appointed. 42 people have held the Office of the Sheriff since that time. Sheriff Vaughn served until 1830 when Alexander McKenzie took office. Sheriff McKenzie served until 1832 when Daniel C. McLeod took over the office. Daniel C. McLeod was the first Sheriff who served two terms in office. The first term was 1832-1834, and the second term was 1836-1884. Sheriff A. Bellamy served his term as Sheriff from 1834 until 1836 when Sheriff McLeod took the helm again. Alexander Campbell was elected sheriff and took office from 1840 until 1842. Giles Bowers was in the office of Sheriff from 1842 until 1844. Sheriff Bowers was previously the Clerk of Court in Walton County, taking that office at the age of 22 in 1836. William W. McCollum was elected sheriff and took office in 1844. He remained in office until 1846. He was the sheriff for two more terms from 1849 until 1853 and then again 1861 until 1865. On January 6, 1846, Enos Evans took office until October 24, 1847. It is unknown why his term in office was so short lived. Anthony Hartley Brownell was elected and took office on October 25, 1847, and he remained there until November 8, 1849. Alexander C. Monroe, sometimes referred to as Neil, began his term in office in 1853 and was acting sheriff until 1857. John Lauchlin Campbell served two terms in office. The first term commenced in 1858 and ended in 1861. His second term was from 1865 until 1867. Samuel Rutan began his term as Sheriff of Walton County in 1868, holding office until 1872. Records are not clear, but there is indication that Sheriff Rutan was succeeded by Lafayette Calvin McDonald in 1872, but in that same year, John Alexander McLeod took over the office of Sheriff. Neil McPherson Campbell was elected in 1873 and retained office until 1877. Sheriff Campbell resigned and the governor appointed James H. Rice until March 1, 1878 when he resigned his post as Sheriff. The Governor then appointed William Bethune McLeod on May 6, 1878. Sheriff McLeod was also the Tax Assessor and the Tax Collector. He served as Sheriff until July 26, 1879. It is unknown as to why he left office. In 1879 the governor was again forced to appoint someone as Walton County Sheriff. This time he chose Joseph Malary. This term was again short lived and he was succeeded by John William Campbell in 1879. His first term lasted until 1891. He was appointed for a second time on March 6, 1898 and served until 1909. Sheriff Campbell was replaced after his first term by Malcolm D. McLean. This was an interim appointment, and he was replaced by John C. McSween on April 16, 1883. He served as Sheriff until January 8, 1889. It is noted that Sheriff McSween was also referred to as doctor. In 1889 Sheriff John Alexander McLeod defeated Sheriff McSween and took office. This would be the second term for Sheriff McLeod. He remained in office until he died suddenly of natural causes while still in office. He was replaced by Marvel Manning. Sheriff Manning served until March 6, 1898. James Murdock Bell took office on January 5, 1909. On July 27, 1916 Sheriff Bell died in Baltimore, MD at John Hopkins from complications surrounding a tumor. He was brought back to Walton County for burial. Jefferson Ballou Cawthon was appointed as interim Sheriff after the death of Sheriff Bell. 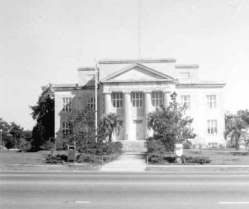 Sheriff Cawthon held office from 1916 until 1917. Thaddeus “Thad” Bell was elected in the following election as Sheriff. Sheriff Bell took the office on January 2, 1917. 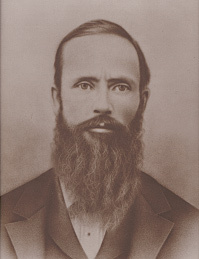 Sheriff Bell was the brother of the former Sheriff James Murdock Bell. Sheriff Bell served until January 3, 1933, at which time he was severely wounded by a gunshot to the face which ended his career and subsequently led to is death. Monroe H. Prescott took office on January 3, 1933 and served until 1937. He was appointed for a short time again from 1939 until 1941. Sheriff Daniel “Dorrie” Clayton Adkinson was elected to office and began his term on January 5, 1937. Sheriff D.C. Adkinsons term was short lived as he was shot in the back as he was talking to a prison guard while standing in front of the guard’s home. A county constable shot and killed both men, because he believed they were plotting to have him fired. He was killed on April 7, 1938. Sheriff Adkinson’s wife, Celia Adkinson, was appointed as Sheriff on April 18th. She was the second woman in the state of Florida to ever be appointed as Sheriff. Celia continued to hold office until 1939. Robert E. Gatlin was elected and began his term of office on January 7, 1941. Sheriff Gatlin was shot and killed by a bootlegger on November 12, 1942. Sheriff Gatlin and Deputy Curtis Miller, who later became Sheriff, went to the home of Alfred E. Snipes to serve a search warrant for illicit liquor. Sheriff Gatlin was shot by his own gun by Snipes, and Deputy Miller was badly beaten by Snipes before he made his escape. Snipes was later caught and arrested. Theron Aubrey McDonald was appointed to replace Sheriff Gatlin on November 16, 1942. Sheriff McDonald continued his term until 1945 when he ran for re-election but was defeated by his chief deputy Curtis Miller. Sheriff Curtis Ralph Miller commenced his first term in office on January 2, 1945 and continued until 1953, when he was replaced by former Sheriff Theron Aubrey McDonald. Sheriff McDonald held office for his second term until 1957 when he was once again defeated by Sheriff Curtis Miller. Sheriff Miller remained Sheriff until 1961. Thomas “Andy” Howard Anderson’s tenure in office commenced on January 3, 1961. Sheriff Anderson died of natural causes while in office, and his wife, Ethyl C. Anderson, was appointed to the office in October of 1970. Mrs. Anderson’s reign as a Walton County Sheriff was brief. L. S. Sam Campbell was appointed on December 10, 1970. Sheriff Campbell was elected to the office in 1972 and held the Office of Sheriff until 1976. Sheriff Campbell went on to represent Walton County in the Florida legislature. 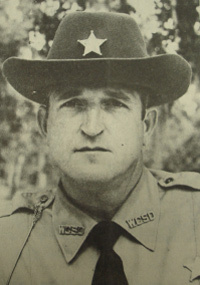 Jesse Aubrey Carter, Sr. was elected as Sheriff on November 4, 1976. He won the election by 1,570 votes. Sheriff Carter lost the next election in 1980 to Quinn Arlen McMillian. Sheriff McMillian took office on January 6, 1981. Quinn A. McMillian was the longest serving Sheriff in Walton County history. Sheriff McMillian served the citizens of Walton County for 20 years. When Sheriff McMillian took office, he had a total of eight deputies. Sheriff McMillian was passionate about the eradication of marijuana in Walton County. In 1982, Operation Butterfly used Paraquat for the eradication of marijuana in Red Bay, FL. This field was located by Deputy Allen White. This was the first time that this herbicide was ever used for eradication due to the size of the field. During his tenure, Sheriff McMillian also facilitated getting a substation on South 393 that operated 24 hours a day in Santa Rosa Beach. The substation was opened in December of 1983. Under Sheriff McMillian, a new jail and administration building was constructed at the cost of $3.2 million. The new jail was designed with 101 beds. The Sheriff’s Office moved into the building at 72 N. 6th Street in September of 1987. By utilizing the new space inside the jail to house not only county inmates but also federal inmates, the Sheriff paid off the debt of the jail a year early. Before leaving office, Sheriff McMillian broke ground on the new sub station on 331 South. In 2000, Sheriff McMillian lost his bid for re-election to his sixth term to Ralph L. Johnson. 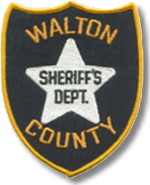 Sheriff Johnson held two terms as Sheriff of Walton County. Under Sheriff Johnson, the Santa Rosa sub-station was completed. The Sheriff’s office was re-located to a new building at its current location of Triple G Road. The Sheriff relinquished control of 911 communications and the county jail to the Board of County Commissioners during his tenure. The Office of the Sheriff grew tremendously under Sheriff Johnson. The number of employees grew from around 65 deputies when he took office to 164 in 2008. Sheriff Johnson retired from office on December 31, 2008 after being defeated for a third term by the current Sheriff, Michael A. Adkinson, Jr.